A is for a blog post that will start of the summer! Because to be honest I was having a bit of writer’s block and couldn’t quite come up with any inspiration. B is for “build a bridge and get over it”, one of the best lines I ever heard from one of my friends. I have learnt to use this as a motto for so many things in life, reminding myself not to take things too seriously, and to just keep moving forward. C is for college, which I’ll be finished with this time next year. I can’t wait and yet am also filled with sadness as it’s been such a journey and getting to know all my classmates has been a privilege. But yay, no more studying and exams – can’t hardly wait! D is for dancing, which I love but haven’t done much of in the last few years. I hoped to go to the Irish Salsa congress this year but can’t! I’m distraught over it. I think dancing in the kitchen counts. E is for emigrant. I have now lived longer outside Zambia than I have inside it. G is for German, which I took for three years in school but had to drop one language after the junior secondary exams and just when I was starting to actually use it in real life (read outside school)… Sigh. see B again. H is for hair. Mine which I have learnt to love. I follow natural hair blogs and dreadlock styling vlogs on Youtube. I have serious hair crushes on so many bloggers! And I’m learning to take care of my daughter’s hair, which is frustrating as all my accumulated black hair knowledge goes to waste because her hair is more on the white side. I is for ice cream. My other motto in life is that I never want to go to my grave thinking “I should have eaten more ice cream”. I eat it whenever I can. Yum! J is for Jimmy Lee, which was my favourite Aretha Franklin song for years and years. I was in my twenties before I realised what the song was actually about! I still love it and it’s still one of my favourite songs. Her voice is AMAZING! K is for Kitchen appliances. If I won the lottery I’d buy them all! *cue maniacal laugh* I have a mandoline, a rice cooker, a bread machine, a steamer, a slow cooker, and I would kill for a food processor. every recipe I see has a bit where you have to do something or other in one. Sigh. L is for language, which I have a slight gift for, but don’t utilise enough of. In Zambia most people take it for granted that you speak three languages – your mother tongue, the language of where you live geographically, and English. it’s the basics. I’m slowly losing that, but can’t change that at the moment so…erm…see B.
N is for Namonda, my beloved Banene (granny) who I miss every day and still can’t believe is gone. Her names live on, so she lives on, in me and all her descendants and at least there is that. it’s also for the long line of strong women that run through my ancestral line – Nachiila, Nakantu, Namoonga, Namwiinga, Namalambo…I love them to bits. O is for Opera, which I’ve promised my sister if we ever win the lottery we’re so going to “La Boheme” preferably…heeheehee inside joke there. I actually went to the phantom of the opera a few years ago and was blown the f&*^ away! P is for Potatoes, which Rox won’t eat. We live in Ireland, land of potatoes. Her dad is Polish, serious potato people, and she won’t eat potatoes. boiled, fried, sauteed, made into cakes, nothing. I give up. Q is for …erm….yeah, I’m just blank on this one. R is for my beautiful Roz, who made me realise what true unconditional love is. Hers, not mine. Because kids…oh my gosh they just love you and love you and love you despite all your insecurities and mistakes. S is for Square dancing which I plan to do at some stage in this life. T is for Tonga of course. My tribe, my language, my people. culture, (some) traditions. U is for umbrella especially a small hand bag sized one which I always have, rain or shine, in Ireland because you just never know. V is for Victoria sponge cake which I tasted one and hated. Bleugh. W is for water, best drink in the world. I drink tons of it. I actually get headaches if I haven’t drank at least 1.5 litres in a day. X is for xylophone. Most specifically those used by the Tonga, that just rock! It’s called kankobela in chitonga and is played using the fingers. I bought one a few years ago but my soft city hands couldn’t quite get it right. to hear a sample of it, follow the link here: They even have a Tonga song played to it. Happy days! Y is for “you wear what you sew”, which is one of my favourite twisted sayings. It makes sense in its own right and retains the meaning of the original “you reap what you sow”. I love it! Z is obviously for Zambia, which you should visit because it’s beautiful and friendly and has one of the seven wonders of the world. The mighty Mosi-o-tunya falls. Edit: I’d now like to tag Mira at Everyday cooking with Mira and Mamai with no middle name. Of course these are all for fun, so no pressure. And if anyone else wants to join in, please do, it’s a lot of fun. B is deadly. I love it. I’m robbing it! Oh do! I use it all the time now and it cracks me up. Love R. Love it. And yes, I agree. Unconditional love. I seriously had no idea what love was before her. They’re just amazing aren’t they? I hear you on the kitchen appliances……so many, so little space, money etc. I guess I’ll have to refer to B too. I know1 And it looks like something I should love…I was and still remain, gutted. As to appliances,I regularly go into Arnotts and Debenhams and try not to drool. Rob away. I had two options- Xray and xylophone and had nothing to write on Xray. I’ll look out for what interesting ones you use on Z, X and Q too. Zambia sounds nice. I found this tag very hard to write. But you did brilliant. It is great to get to know you all better. You don’t like Victoria sponge?! Whaaaaaat?!! I loved the N- the Zambian names are fantastic. Your posts make me want to go there 🙂 Someday! I know! it looks like something I should love but…. *shudder* You’ll have to make me one to change my mind…nomnomnom. And do visit there…someday. I don’t have a rice cooker, a bread machine, or a mandoline; I have a slow cooker that I’ve used about three times in ten years, but I do love my food processor. Trade some of the others in for one! I think the one I tasted had cream and I don’t do cream. Who knows, perhaps Emily will take me up on the challenge and change my mind 🙂 And I can’t believe you have a slow cooker you don’t use! that’s criminal. And I’m well jell of your food processor. 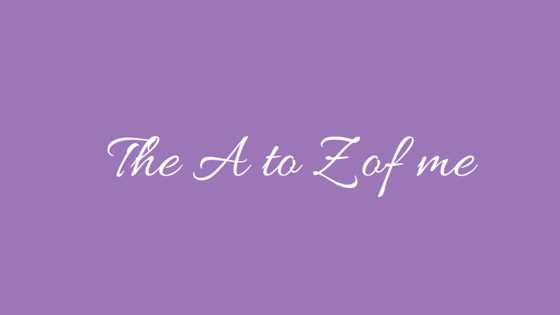 I started by reading other A to Z posts and got so absorbed in them, you made the right call writing yours first 🙂 I’m going to wander over and read it now. Thanks for commenting and the twitter follow. Previous story What I’ll be doing on my summer vacation (1) – Netflix! !